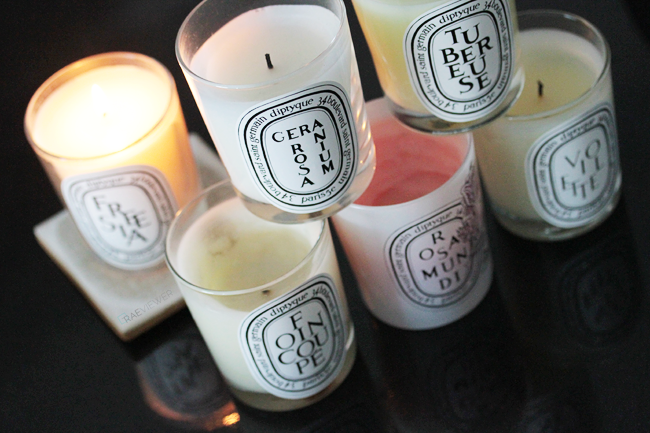 I love Diptyque. I love the aesthetic, the branding, and the products themselves. So a few years after my first Diptyque splurge, I have amassed quite a collection. Now, I normally shy away from home and lifestyle content, but I figured it was time to open up and share how I make my home more cozy. Home Fragrances are split into candles, room sprays, and scent ovals, so we will tackle one category at a time after the jump. I will also share my Eau de Parfum, Eau de Toilette, Solid Perfrume, and Roll-On personal fragrances, so make sure to read on if you're interested! I lost a majority of my sense of smell after a long bout of bronchopneumonia as a child. Hence, my nose is very, very dull. The first time I walked by a Baies candle, however, I knew I had found my 'forever' scent. It was the perfect balance between rose and blackcurrant — a hint sweet with plenty of green; Baies was memorable. It was unlike any candle I had ever smelled before because it was sensual yet fresh. Most importantly, I could actually smell it. And that was the beginning of my Diptyque addiction. I ordered the deluxe black glass Baies candle and enjoyed every single burning hour. It filled up my cramped old college apartment, to the tippy top of the vaulted ceilings and eliminated cat litter odor (at least for a couple hours). It made me want to sit back and sip on a glass of red wine (even though I did not even drink wine then). Baies allowed me to relax and bask in a scent without having to endure a throbbing headache a few hours later. Even after years of collecting Diptyque, my most frequently burned candle is still Baies. Since I only purchase candles with fragrances I can actually detect, it limits my options. 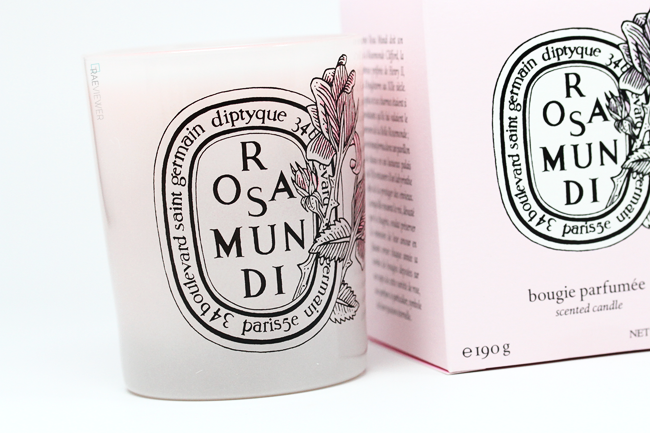 Some brands produce candles so potent that they induce migraines, but Diptyque's candles strike the perfect balance. They also burn the cleanest, meaning that it is possible to repurpose the glass jars. Of all the Diptyque candles I have tried thus far, however, Gardenia (above) is the most subtle. I can hardly smell it, but my guests have mentioned how lovely it is so I burn it only when I have company. 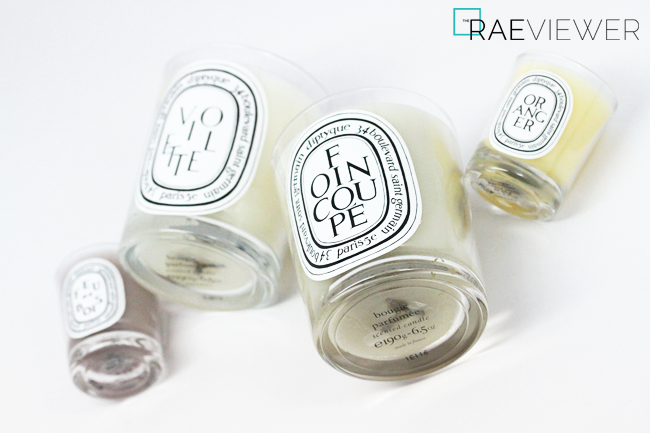 My candle favorites are Baies, Foin Coupe, Geranium Rosum, Violette, and Verveine. The throw on all these candles is highly impressive. Foin Coupe is fresh mown grass with wild flowers, and this seems less popular with the ladies but I personally adore it. Geranium Rosum (boutique exclusive) is a strong floral but not aggressively or overwhelmingly so. Violette is a sweet violet scent with a hint of powder, which is incredibly therapeutic and ideal for burning with a bath. Verveine is best suited for the kitchen, especially after whipping up pungent dishes like Korean BBQ or grilled fish. After experimenting thoroughly with Diptyque's vast selection, I have discovered that I enjoy fruity, floral, and woody candles most. I vehemently dislike incense in the home, but that's just my personal preference. 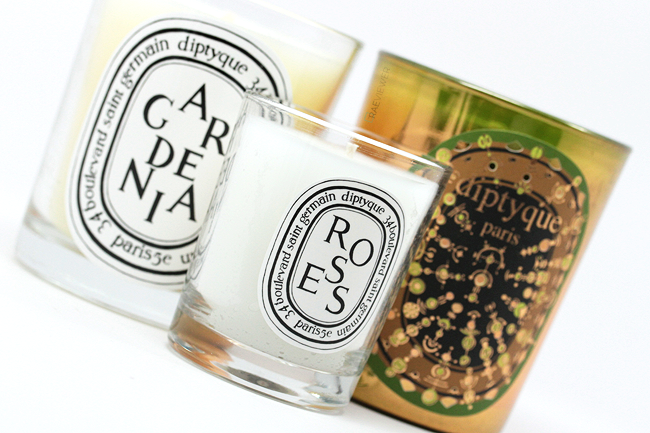 Diptyque does offer spicy and smoky candles, but I would only ever purchase them in the mini (smaller) size. The larger candles are 6.5 ounces and burn for 60 hours, which is a better buy, but the mini candles require less commitment. FYI: Most of my candles were photographed fresh out of their boxes and do not reflect current states of usage because after all, brand new products look so much prettier in pictures! 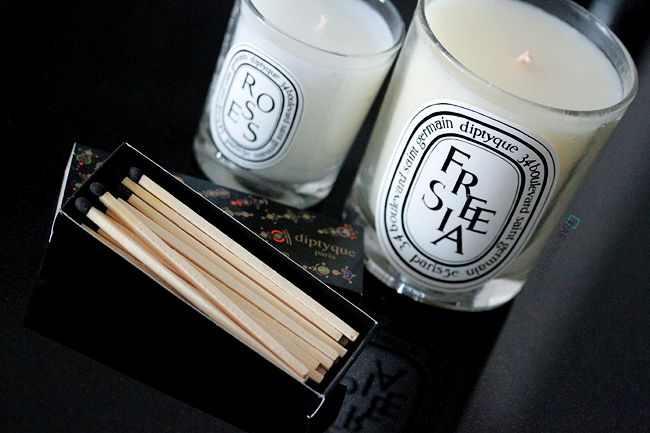 Furthermore, Diptyque makes fabulous matchsticks. My sales associates usually toss them in with my purchases, especially during GWP season. I love hearing the match strike, and I don't have to worry that it will burn my fingers off since it burns slowly. I can easily light multiple candles with a single matchstick. 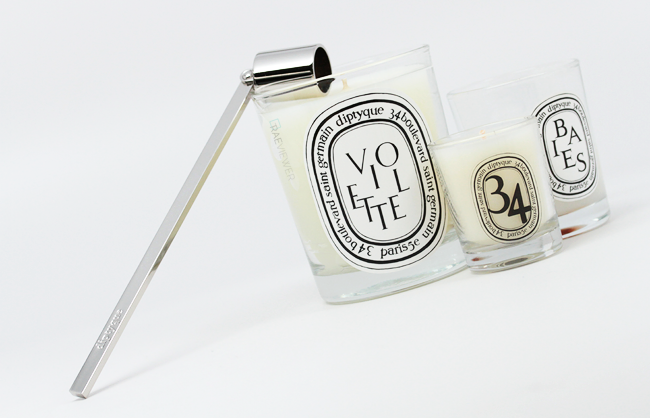 Other than matches, Diptyque accessories include the Candle Snuffer and Wick Trimmer. I think the snuffer is more of a luxury, but it prevents the smoke from leaving residue all over the wax. Clean white candles mean more picturesque candles for display. 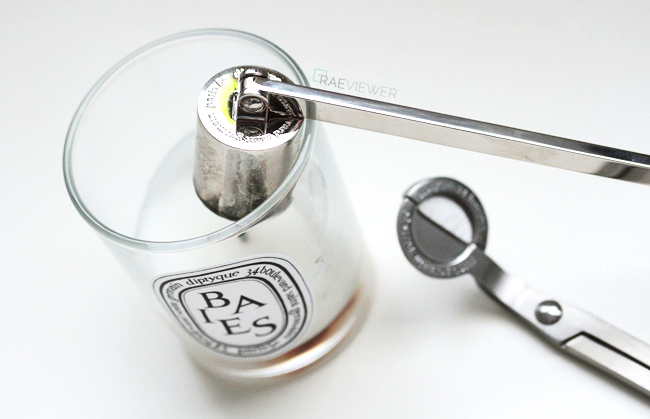 The Wick Trimmer is more useful, especially if you purchase mini candles. I had tried multiple pairs of standard scissors before caving, but the half-moon bases of the Diptyque blades catch the trimmed wick from falling into the melted candle. I highly recommend the Wick Trimmer! Now let's discuss the super low maintenance Scented Ovals! 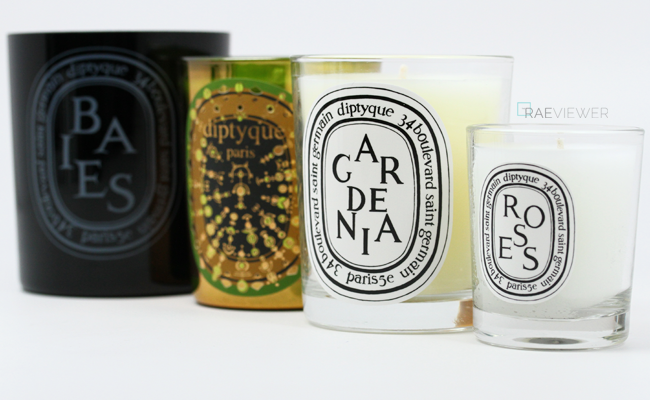 As pricey as these are ($45 USD each), Diptyque scented ovals are fabulous for bathrooms and linen closets. 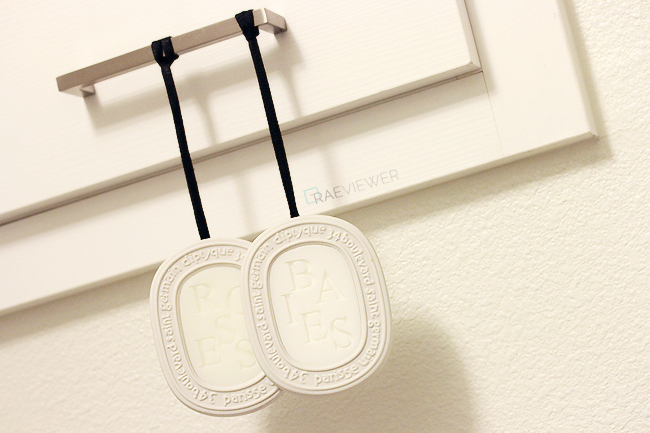 I hang them in my bathroom (see below) because they are such simple yet beautiful decorative pieces. I love how the hand-crafted porcelain rings make a statement, and the delicate fragrances emanate for a good three months. You can also slip these into a lingerie drawer. I love these so much, but I do wish refills were available to reduce the costs of replacement! I also keep the Baies Room Spray in my office. Since it also functions as my shoe closet, makeup closet, and photography station, I like to keep my office smelling as fresh as possible. Just one spritz makes an enormous difference and lasts for most of the day. No need to supervise a burning candle! And in case you didn't notice, yes, I love Baies so much that I leave the scent all over my apartment. Now that we have covered candles, scented ovals, and the room spray, let's move on to personal fragrances from Diptyque! These are not necessarily the most long-lasting on my dry skin, but I do love the variety offered. I own the Eau de Parfums, Eau de Toilettes, Solid Perfumes, and a Roll-On. The packaging is all top-notch. Solid Perfumes are my favorite personal fragrance offering from Diptqyue because solid perfumes are harder to come by these days. I purchased my first one in L'Ombre dans l'Eau and brought it home with absolutely no idea how to use it. I did not dare dip my fingers into it, but I soon discovered that is exactly how a solid perfume is applied! I swirl a clean fingertip into the soft scented wax, and then I dab it gently onto my wrists and tap it behind my neck. A little goes a long way! Though the L'Ombre dans l'Eau EDP is my signature scent, I find the solid perfume version wears a lot more smoky on me. Hence, I only use it to layer. The Do Son Solid Perfume wears far better on me than I expected because it stays sweet and feminine. I knew I would like it, but now has now become a staple in my handbag. 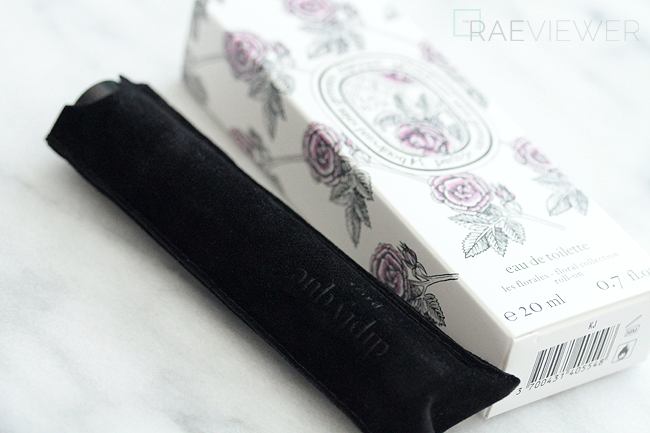 The Eau Rose Roll-On is my newest addition to the Diptyque line-up, and I adore it. 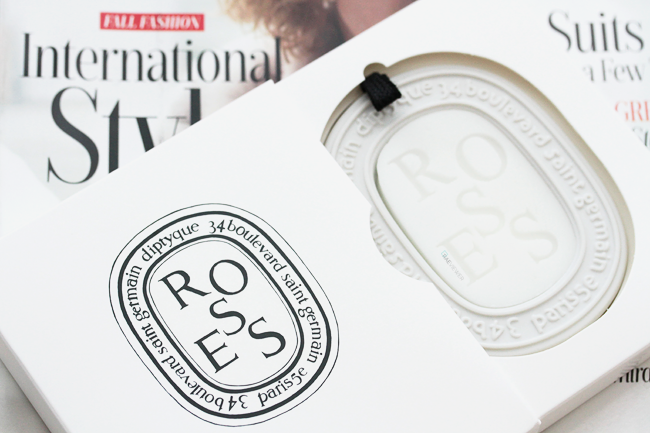 The luxe velvet pouch, the moody graphics, and the perfectly rosy fragrance make this the perfect travel companion. It is excellent for touch-ups throughout the day, and the metal rollerball has a cooling effect on the skin. 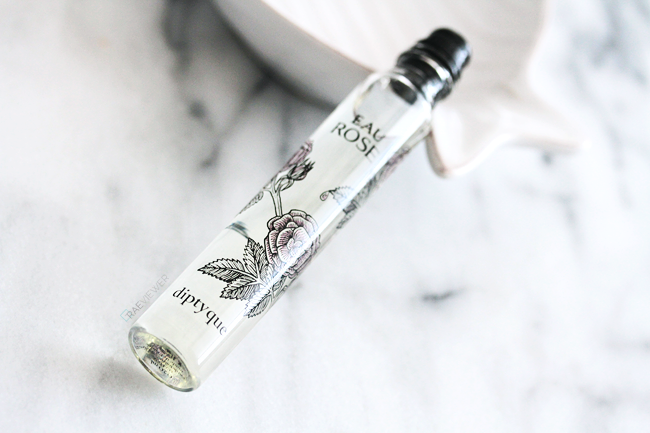 A cool tidbit is that Diptyque will donate 20% of the proceeds from each Eau Rose Roll-On to The Pink Agenda, a not-for-profit organization committed to raising money for breast cancer and research and awareness of the disease among young professionals (October 2014). Now for the Eau de Toilettes! Oyedo and Philosykos are two entirely different fragrances. Between the two, I prefer Philosykos because it is fresh, vibrant, and has a hint of fig's milky sweetness. It has an effervescent quality that is ideal for wear during the summer or daytime in general. Oyedo is hit or miss with many, but I quite like it! It is very aggressive for the first ten to fifteen minutes and may be somewhat reminiscent of Pine-Sol, but I love the dry down. It is fresh, citrusy yet fruity with a thyme background that makes it both deletable and special. Last but not least, here are my Eau de Parfums! As mentioned previously, L'Ombre dans l'Eau is my signature scent. I purchased it only because the sales associate informed me that it was the personal fragrance accompaniment to Baies. L'Ombre dans l'Eau does indeed smell like the Baies candle on my skin, like a garden of voluptuous, sweet roses and their green stems, and it lasts for a good six hours. The Philosykos Eau de Parfum is more masculine than I expected, but I layer it with LODLE occasionally. If you are anything like me, I would recommend trying the Philosykos EDT first and enjoy the brightness of the scent before dabbling with the Philosykos EDP! That's finally a wrap for my Diptyque collection! I usually purchase my candles and fragrances from Space.NK and Nordstrom. SpaceNK.com will be offering a promo code starting Tuesday, October 14 through midnight EST on Tuesday, October 21. Online shoppers will receive $20 OFF orders of $75 or more with the code DISCOVER20 at checkout (US website only). Additionally, you'll score free shipping and 3 complimentary samples of your choice! Such a lovely overview. I bought my first Diptyque candles a year back thanks to your blog. You also need to try their skincare - absolutely lovely! Awesome! I have a sample of the moisturizer with SPF15, and it's quite good! Diptyque usually has wonderful holiday samplers. The candles in each set are small, but each candle lasts much longer than votives of the same size and the fragrance does not diminish with use. Nordstrom's sampler from last year was a wonderful way to introduce people to a variety of Diptyque's Classic fragrances. Once you become accustomed to the clean true scent of fine candles, there's no going back. Yes, it's such a shame that the sampler sets are not available all year round! 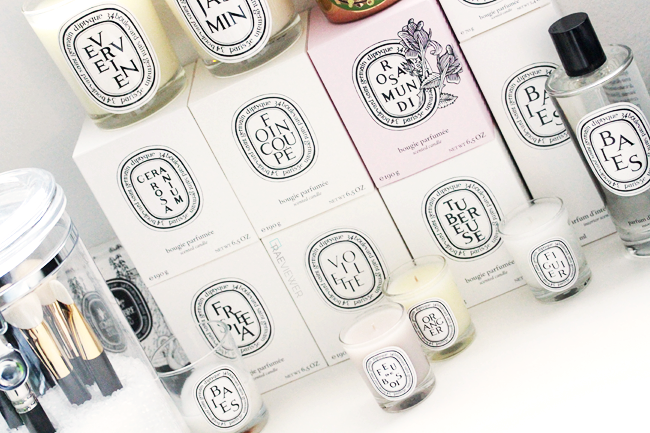 Thank you for this overview of Diptyque products/scents! You make me want to purchase at least of perfume and one candle to try! 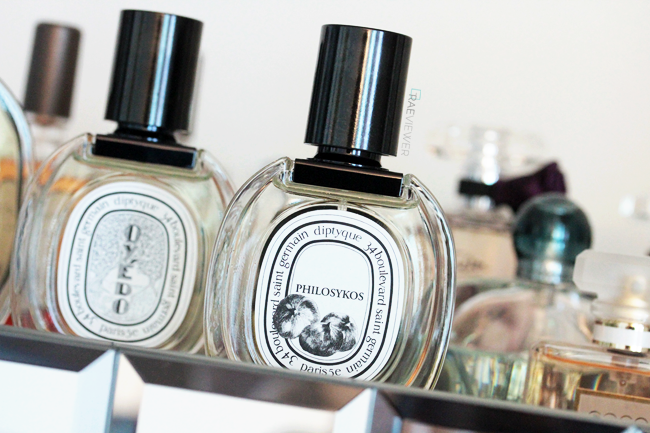 Do you prefer Diptyque over Jo Malone, or would you say the two brands are too different compare? Thank you again! You're welcome! I enjoy both, but I do prefer Diptyque to Jo Malone.. 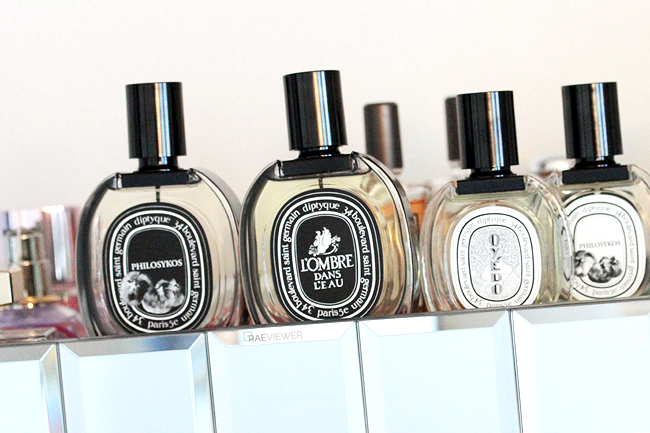 I only have a couple JM favorites, whereas I think a lot of Diptyque's products are must-haves. JM is more feminine and girly with chic packaging. 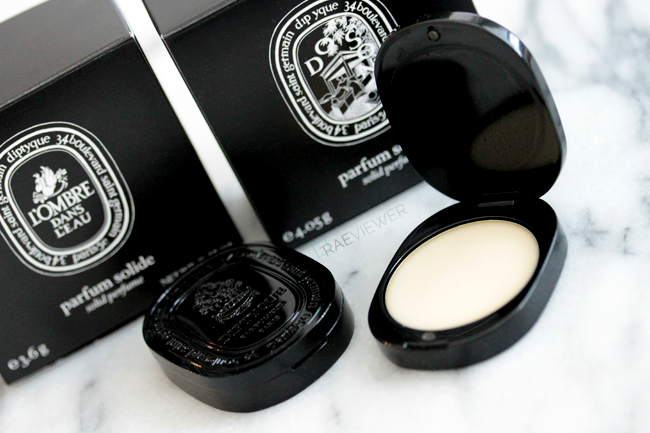 Diptyque tends to be bolder, unisex, and maintains the apothecary feel and look. Hope that helps!